A new report from Globalwebindex looks into the power of recommendations on social media in inspiring and motivating purchase considerations. Brand discovery is where peer-to-peer recommendations on social media have the most impact – as much as 27% of Millennials cite this as a way of discovering new brands, and a significant portion of Gen Xers also say that these inspire their brand considerations. Elsewhere, a fifth of internet users say that lots of “likes” or good comments on social media would increase their likelihood of purchasing a product, climbing to almost a quarter of Millennials and Gen Zers. While Facebook still forms the backbone of their social media portfolios, Gen Zers and Millennials also have a considerable presence on other platforms like Instagram, Snapchat, Tumblr and Pinterest. The image and lifestyle-centric nature of these platforms has made them prime candidates for influencer marketing, especially among young females. 52% of female Gen Z Instagrammers have visited a celebrity’s page on the platform, for example. 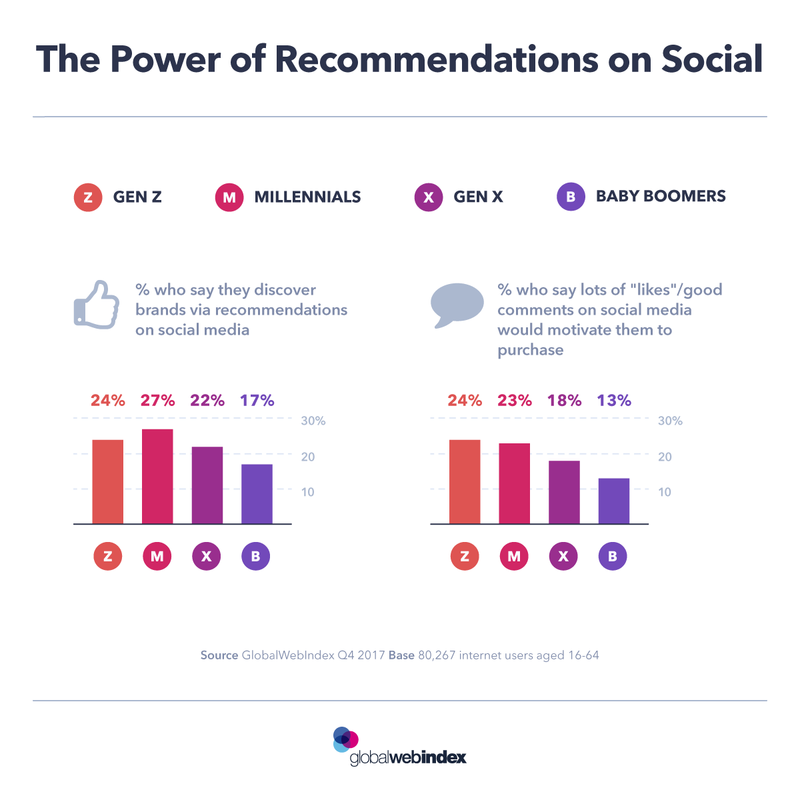 This chart from Globalwebindex looks into the power of recommendations on social media in inspiring and motivating purchase considerations.